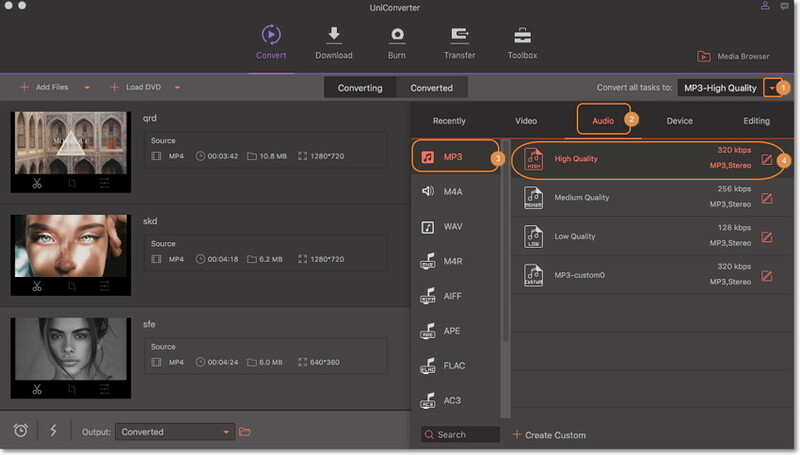 Convert MP3 audio to WAV, M4A, WMA, FLAC and any other video/audio formats. MP3 (MPEG-1 Audio Layer-3), is a convenient, versatile and popular way of storing music and other audio files. One of the main advantages lies in its comparatively small file size that saves storage space and bandwidth while sharing files. There are times however, when you need to convert MP3 files into other audio formats such as WAV, AAC, FLAC or OGG on your Mac due to compatibility issues with media players and devices. If you are searching for an MP3 converter that helps to convert to or from MP3 format on Mac, we have prepared a list of the top 5 MP3 converters for Mac that will get you the best results. 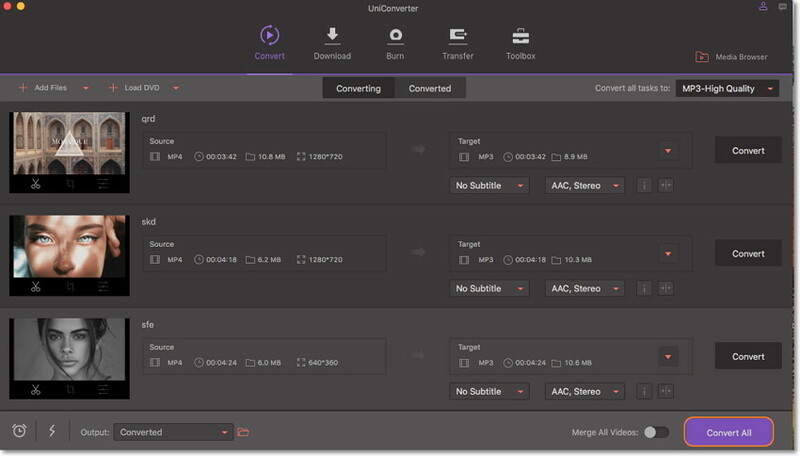 Wondershare UniConverter (originally Wondershare Video Converter Ultimate) tops this list as the best MP3 converter for Mac available today. It quickly and efficiently converts MP3 to numerous file formats for Windows, Apple devices, Blackberry, Zune, Android, video game consoles, YouTube to MP3 converter Mac and many more. Its main attractions are its quick conversion speeds and high-quality output, while being economical on system resources. It also features an intuitive interface that is easy to use and allows for batch MP3 conversion as well. Launch Wondershare video to MP3 converter, click to import your target video to the program. You can also add your favorite YouTube video for MP3 extraction as long as you download YouTube video on your Mac beforehand. Click beside Convert all tasks to: and you'll get a full list of output formats, which consists of Recently, Video, Audio, Device and Editing. If you want to convert video to MP3, just go to Audio > MP3 and select a resolution in the right. The same goes for other video or audio formats. Once you're satisfied with the output format, just hit Convert All in the bottom right to start converting video to MP3 or vice verse. Apart from MP3, Wondershare provides support for over 1000 video and audio formats to which you can convert your media files easily. A ton of customization tools not found in most of the other products on this list. While Wondershare converter is easy to use, it may take some time to discover all of its features and use them to their maximum potential. Conclusion: Mac and Windows users alike will enjoy using this all-purpose software to easily prepare MP3 files for instant playback on any device. Simply select the desired audio format or device from the extensive list of supported options and your MP3 file will be ready in no time. 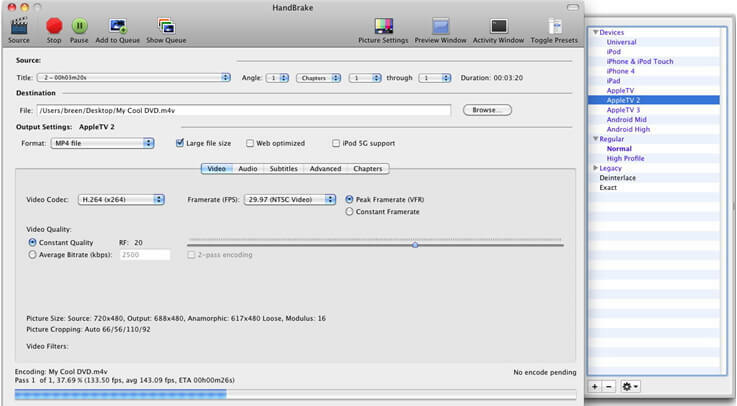 Handbrake is an open source video to MP3 converter for Mac that supports a wide range of formats. Apart from Mac, it is also available for Windows and Linux. Features: Handbrake comes with a decent amount of features that allow for conversion of MP3 audio files. It works with most common audio files and formats, and leverages tools such as Libav, x264, and x265. Handbrake is a good choice if you're looking to convert youtube to MP3 Mac free. It is open source and widely available for free download. Gives users advanced control with customization settings. The main disadvantage of using Handbrake is its intimidating interface that is difficult to navigate, especially for first time users. Conclusion: Other converters featured in this article have user-friendly interfaces, but the same cannot be said of Handbrake. The program is powerful but utilitarian, and will take some getting used to. FFmpeg is a cross-platform solution to convert audio and video. It's the odd one out in this list as it lacks a graphical user interface. Users are forced to input instructions from the command line/terminal. 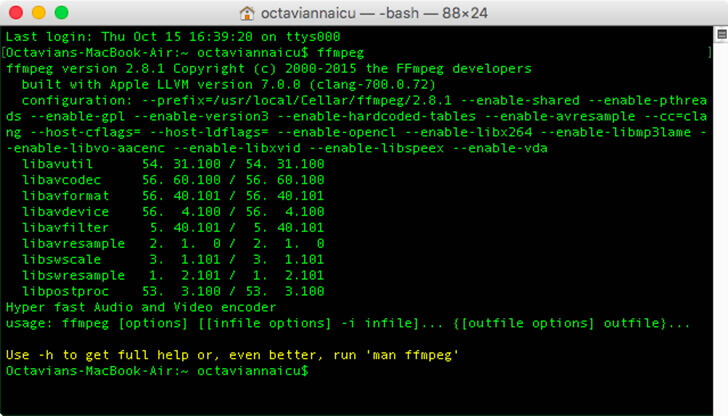 FFmpeg is a truly free MP3 converter for Mac. Features: FFmpeg can convert your MP3 files to and from most audio formats. It uses the free FFmpeg encoder and supports many audio and video formats, including MKV, AVI, WAV, MPEG4, ASF, Quicktime, WMV, M4A, MOV and more. FFmpeg also supports batch conversion. It supports a wide range of codecs and filters. Its official documentation is not clear and can be quite confusing. Conclusion: While a powerful tool, FFmpeg's lack of a graphical interface makes it unsuitable for the average user. Not recommended for anyone interested in learning how to convert youtube video to MP3 on Mac. Movavi is a good youtube to MP3 converter for Mac that will help you to convert your MP3 files to a wide range of formats. It is available for both Windows and Mac. 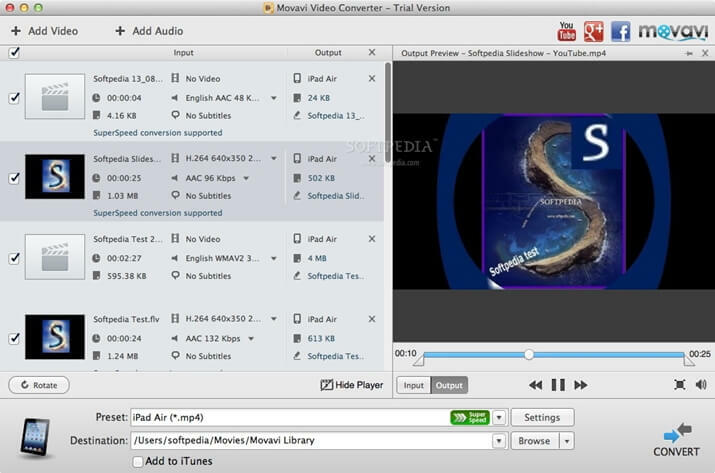 Features: Movavi Video Converter supports MP3 format well and is quite user friendly. Its user interface has improved in usability and navigation, and can convert most of the common video and audio file types. This video converter also comes with predefined settings for various media players such as Windows Media Player and iTunes. Conclusion: While a good choice if you're searching for youtube MP3 converter Mac, its trial version isn't really free. Some users have complaints against its asking for payment even in trial versions. Availability: Paid or "free" trial version. 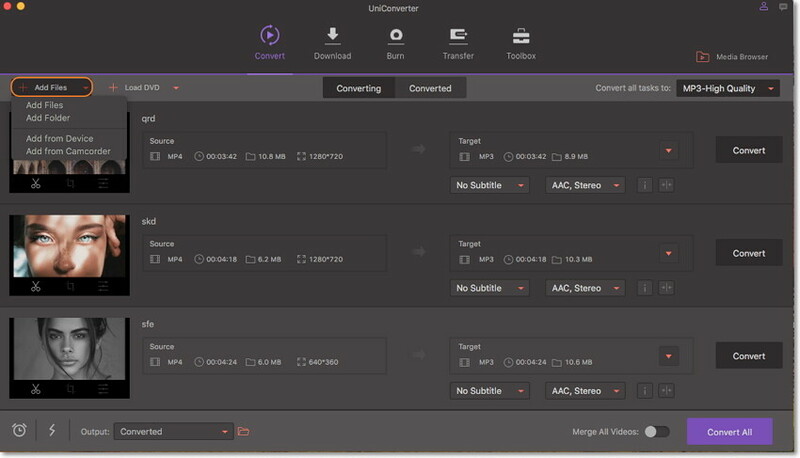 Leawo Video Converter is a multifunctional converter that allows Mac users to convert MP3 files to most audio formats. Popular among users searching for free youtube to MP3 converter for Mac. It is available for both Windows and Mac. Features: This youtube MP3 converter for Mac is compatible with most audio and video formats. 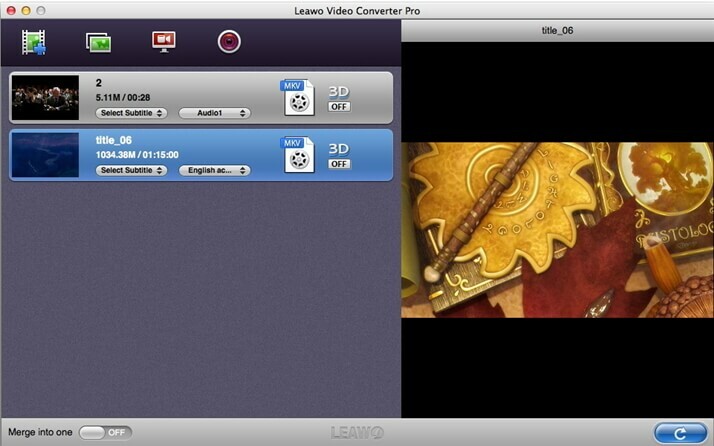 One of the best things about Leawo Video Converter is its ability to convert media files in any combination. For example, you can convert MKV to MP3, MOV to 3GP etc. It also allows you to optimize videos for playback on specific devices, including media players, iPad, iPod, gaming consoles etc. Allows users to customize conversion settings. Lacks many out-of-the-box tools and features found in other converters on this list. Asks that you buy additional features. Conclusion: Leawo is a capable converter that produces good quality results. However, it comes with a limited feature set and requires that you buy extra features such as disc burning and online video downloading tools as separate modules. Unless you have hours to spare while waiting for Leawo to convert video to MP3 on Mac, we recommend you use a different program.